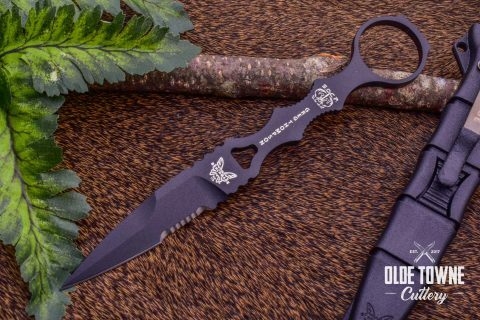 This excellent knife from Benchmade is a bushcrafting work horse. Featuring a 3.75″ CPM3V carbon steel blade, a highly textured tan santoprene handle for all day comfort, .14″ thick spine, and a high quality leather sheath, this knife is an awesome outdoor companion. 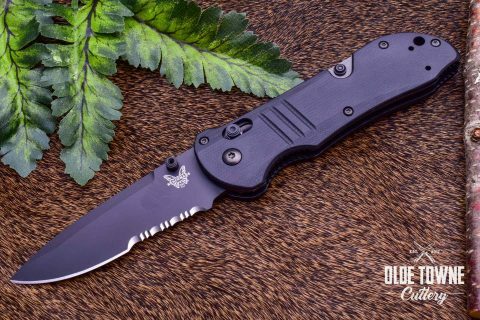 The Benchmade 3150 Impel auto has a black aluminium handle and a closed length of 3.06″. 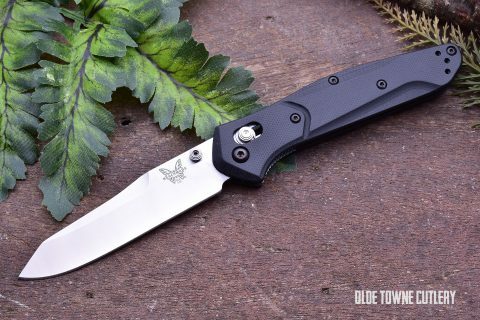 Benchmade 4300-1 CLA Auto Green/Black a lightweight and slim full size automatic knife from Benchmade. 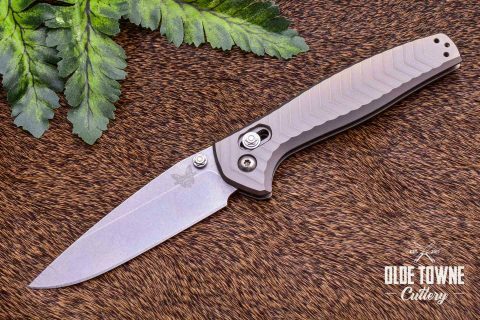 3.4″ cpm154 blade, machined g-10 handle scales and a deep carry reversible pocket clip round out this EDC friendly package. 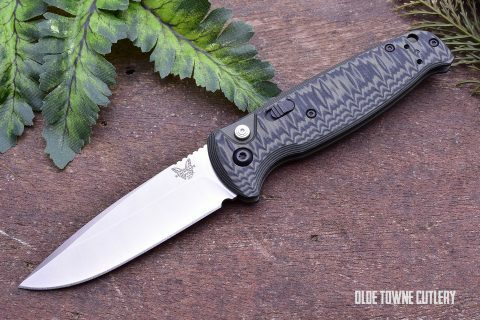 This is a lightweight, pocket friendly full size auto from Benchmade. 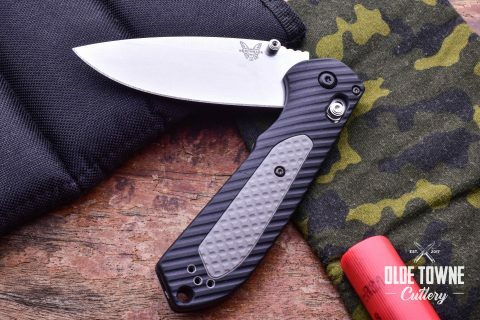 The machined G-10 grips are strong and light, the 3.4 drop point CPM154 stainless steel blade offer full size performance in a slim package and the 3.4 Oz. 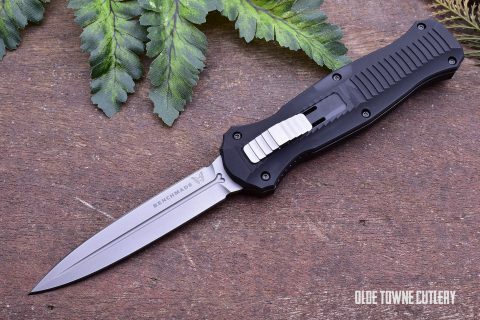 weight and deep carry reversible clip let this slim knife disappear in the pocket. 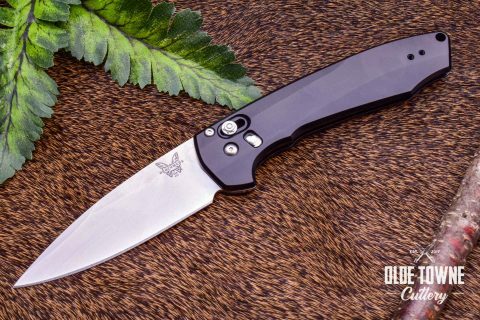 This beefy Auto was designed by Shane Sibert and built by Benchmade. The 3.8″ D2 tool steel blade deploys with a snappy automatic action and secured with the Axis Lock mechanism. 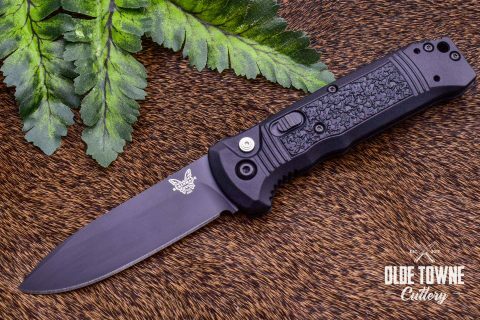 The Benchmade Osborne 940-2 has a black G10 handle and a satin finish 3.4″ reverse tanto blade and 2.7 Oz weight with green highlights. The Infidel sets the standard for USA made production OTF automatics. 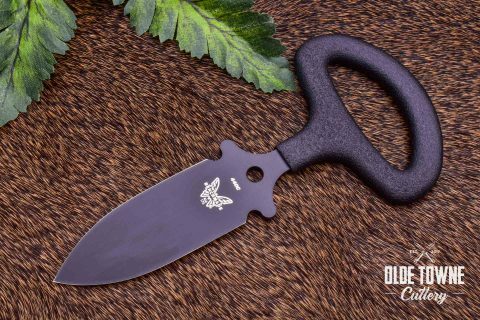 Featuring a side button deployment, 3.95″ D2 tool steel, dagger ground blade with a fuller, and highly textured anodized aluminum handle. The action on this knife is amazing! 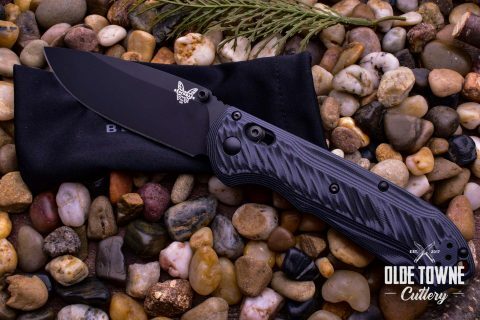 The Benchmade 9600BK Rukus II Auto Black/Black is a great tactical push button automatic pocket knife with a black billet aluminum handle and a closed length of 5.10″. 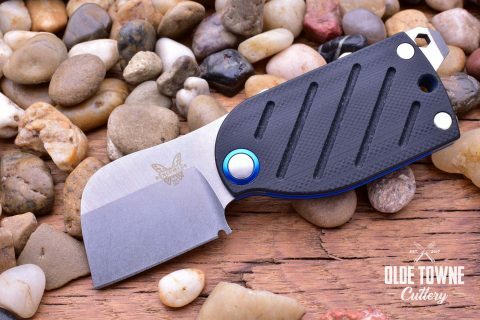 The Benchmade 4400-1 Casbah Auto Blue is a great push button automatic pocket knife to add to your benchmade collection, it has a blue textured grivory handle and a closed length of 4.40″. 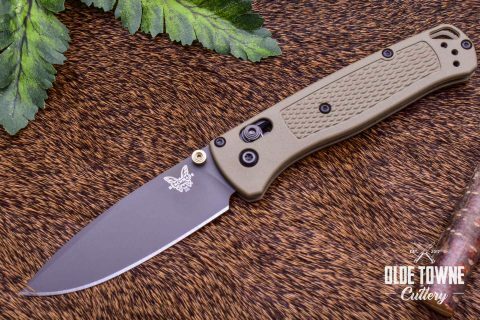 The Benchmade 535GRY-1 Bugout Axis Manual is a great lightweight knife to carry with you, it has a light green grivory handle and a closed length of 4.22″. 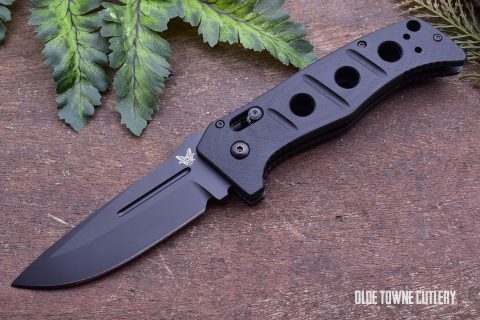 The Benchmade 4400BK Casbah Auto Black/Black is a great push button automatic blade with a black textured grivory handle and a closed length of 4.40″. 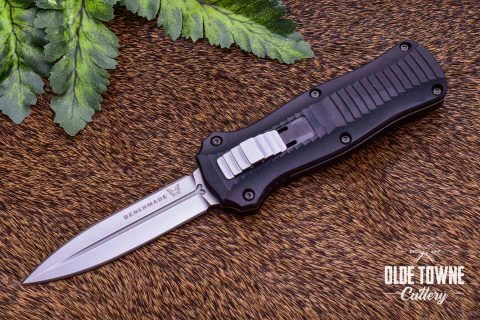 The Benchmade 917SBK Triage Axis Tactical is a great everyday use tactical knife that has a black G10 handle and a closed length of 8.33″. 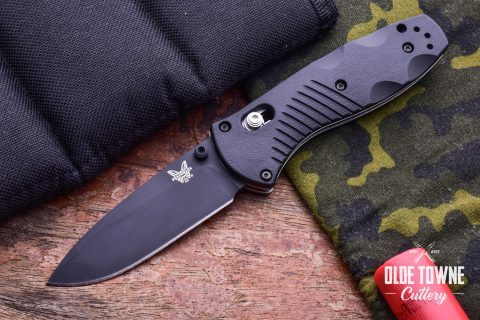 The Benchmade 4400 Casbah Auto is a great push button automatic pocket knife with a black textured grivory handle and a closed length of 4.40″. 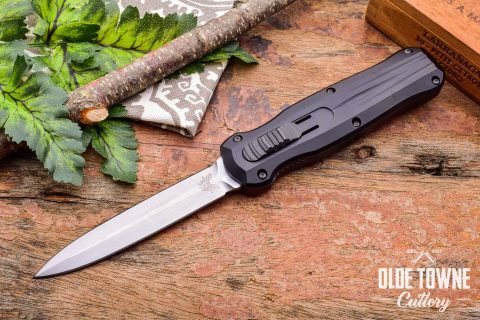 The Benchmade 178SBK SOCP Spear-Point Fixed Blade is a great self-defense tool with a total length of 7.25″. 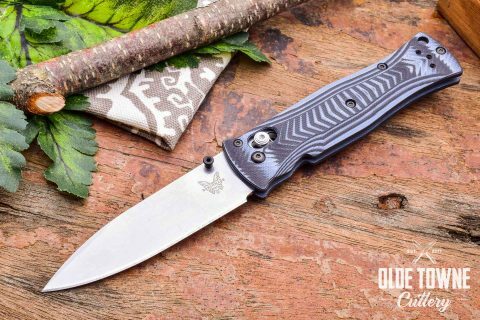 The Benchmade 781 Anthem Axis Manual is a great addition to your benchmade collection, it has a grey anodized billet titanium handle and a closed length of 4.56″. 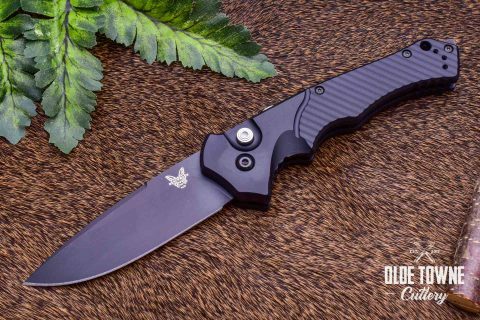 The Benchmade 490 Arcane Axis Flipper is a slim, lightweight and fast action flipper with a black aluminium handle and a closed length of 4.52″. 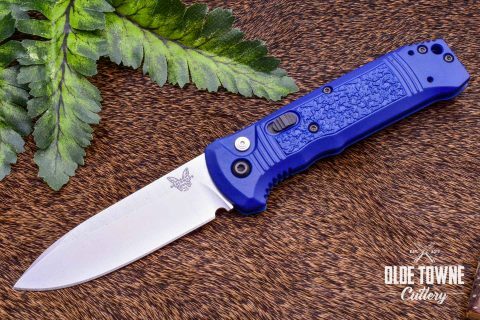 The Benchmade 51 Morpho Bali-Song is a great lightweight classic knife in a black and blue G10 handle and a closed length of 5.40″. 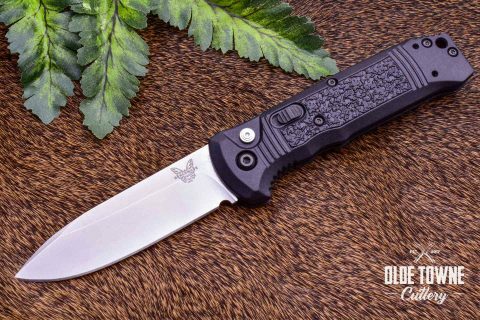 Benchmade 3350 Mini-Infidel OTF features a 3.1″ D2 tool steel dagger ground blade, 3.4 Oz weight. 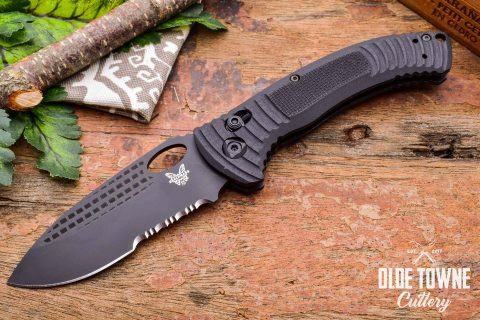 The Benchmade 175BK Push Dagger is a great tactical use fixed blade with an overall length of 5.47″. Benchmade 550-1 Griptilian. 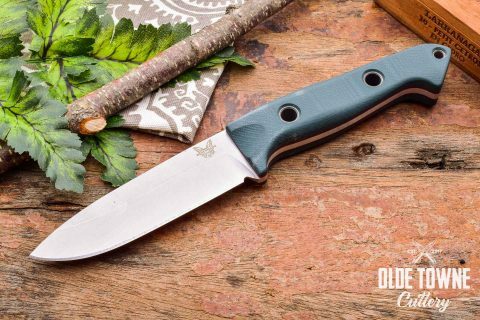 3.45″ plain, satin, sheepsfoot blade. CPM-20CV steel. AXIS Lock. 8.07″ Open length. 4.13oz weight. Benchmade 551-1 Griptilian. 3.45″ plain, satin, drop point blade. CPM-20CV steel. AXIS Lock. 8.07″ Open length. 4.17oz weight. Benchmade 916SBK-ORG Triage. 3.40″ Coated, partially serrated edge. N680 Steel. AXIS Lock. 8.25″ open length. 5.24oz weight. Benchmade 162 Bushcrafter. 4.40″ satin, plain edge, drop point blade. CPM-S30V steel. Fixed Blade. 9.15″ full length. 7.72oz weight. 2.70oz sheath weight. Benchmade 737SBK Aileron. 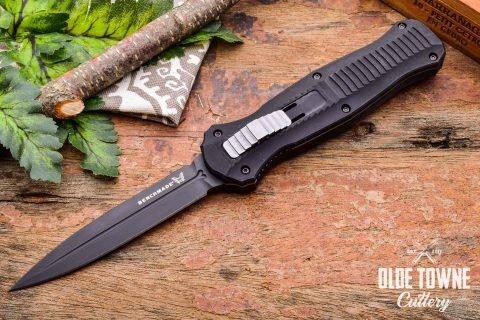 3.45″ coated, black drop point blade. CPM-S30V steel. AXIS Lock. 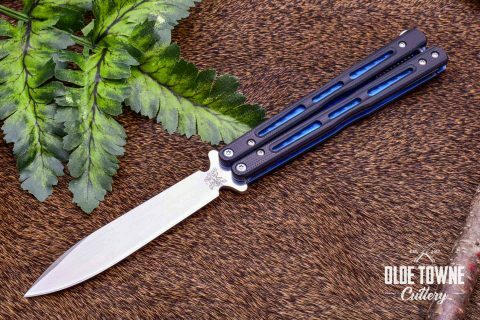 8.03″ open length. 4.24oz weight. 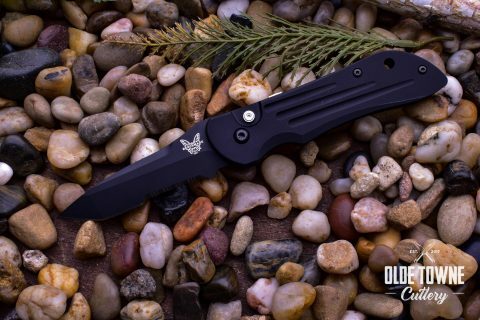 Benchmade 3300BK Infidel. 3.91″ coated, double edge dagger. D2 steel. Out The Front. 8.91″ open length. 4.90oz Weight. Cordura Sheath. 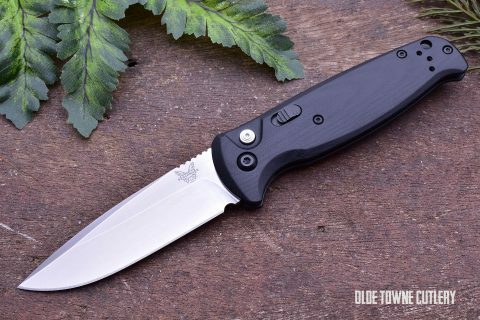 Benchmade 585BK Osborne Mini-Barrage This knife is fast and strong with a DLC coated 2.91″ drop point blade, axis assist speed opening and a safety on the spine.